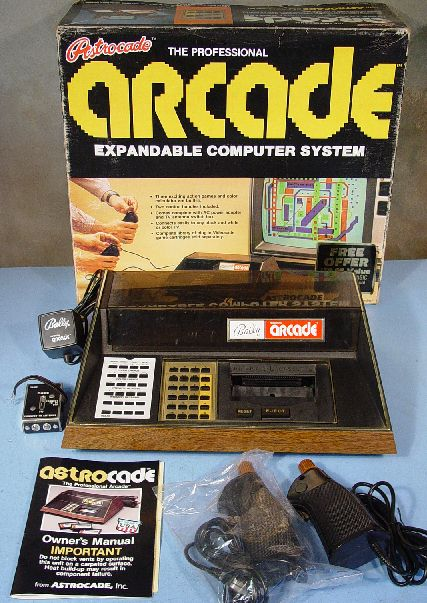 The Astrocade was developed by Midway and released by Bally in 1977 (who were a leading manufacturer of arcade games at the time). Balley shifted the focus of their whole company in 1979 and decided to sell their whole Consumer Products Division, including the Bally Astrocade. It was sold to a company called Astrovision, who continued to market the system using the Bally name until 1985. The console has had more name changes than any other system I can think of. It was originally released via mail order in 1977 as the Bally Home Library Computer. It was then sold in shops a year later as the Bally Professional Arcade. In 1981 it was released as the Bally Computer System though a year later it was rebranded once again as the Bally Astrocade. The Astrocade was a very powerful machine with specifications higher than most other systems available at the time. The front of the system had a 24 digit keypad, which was mostly used for game selection. The controllers were shaped like the handle of a gun and had a trigger button above the grip and a paddle like joystick at the top. Up to 4 controllers could be connected to the console. The console had two built in games: Gunfight and Checkmate. It also had a calculator program and a program called Scribbling, which let you do basic sketches. Additional games were available in cartridge form, which were about the size of a traditional cassette tape. Although the Astrocade developed a cult following, it never enjoyed mainstream success. There were many reasons for this. Firstly, they released the consoles in computer stores, whereas most other consoles at the time were being sold in toy stores and department stores. It was $100 more expensive than the Atari 2600 too. The first consoles which were released were plagued by defects which meant they all had to be replaced. Though the models which were replaced had many faults in them too. However, the ability to write your own programs proved popular with many. The console was also released as an arcade machine by Bally though it wasn’t too successful. The Bally Astrocade was one of the most powerful consoles of the 2nd generation of video games. The console was powered by the Zilog Z80 8-bit CPU, which was clocked at a speedy 3.579MHz (which was about twice as quick as most other CPUs at the time). It had a resolution of 160×102 pixels and 8kb of ROM and 4kb of RAM, though this was expandable to 64kb. 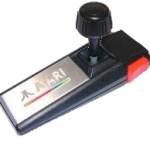 To put things into perspective, the Atari 2600 only had 4kb of ROM and 128 bytes of RAM, which illustrates how powerful the Astrocade hardware was to alternative systems available at the time. The game cartridges had 8kb of ROM in them. Bally Alley – Fantastic Astrocade fan site. Bally Professional Arcade/Comuter System/Astrocade – Good summary of the machine.